This year, the city of San Diego was obliged to trim 3.8 million dollars from the library budget. 3.8 million dollars. To put that in perspective, that’s roughly 760,000 used books off of Amazon. That’s one library, right there. The Ocean Beach library seemed particularly vulnerable to these cuts, given its proximity to the larger but less centrally located Point Loma Library. Throughout the past few years of budget cuts and closing scares, the Ocean Beach community has spoken quite loudly and clearly against the closing of the small Ocean Beach branch on the corner of Santa Monica and Sunset Cliffs. So far, the city is listening, and none of the 37 branches have been closed. The alternative has been a cut in staff and in hours. The new hours will take affect on March 20th of this year. 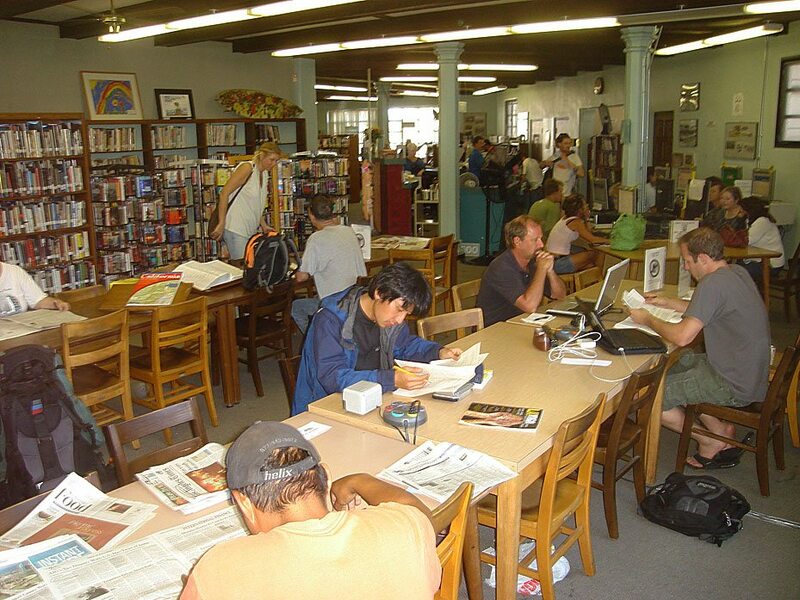 Basically, almost all the branch libraries will be closed Sundays and Mondays, with the exception of Scripps Ranch, La Jolla, and Point Loma Libraries, which will be open from 1-5 on Sundays. Central Library, the heart of the system, will be closed only on Saturdays. Elias Hazou, the acting manager of the Ocean Library, claims that the shorter hours will not seriously damage the staff pocketbooks. Employees have to be at the library an hour before it opens, and also close it, so even though the library will only be open 36 hours a week, employees can still make full-time wages. The cuts also mean that the library is facing a hiring freeze. Therefore Hazou was selected as acting manager of the OB Library when the previous manager was moved to Malcolm X Library. “I am a librarian because of necessity,” says Hazou quietly, speaking in an appropriately hushed library voice. A patron approaches and asks how to us the copy machine, and Hazou obligingly helps her. All around us is the pleasant, sleepy late-afternoon library buzz. Keys click, pages turn, a child speaks too loudly and is shushed. This is Hazou’s domain, soon to be someone else’s. Hazou is only acting as manager until the permanent manager is assigned. The new manager is almost finished with his training, and will arrive at the OB library on March 8th, two weeks before the official change in hours. He has learned a lot about managing a library during his years working for the library system. He is not just tending the desk and checking out books all day. To manage the library Hazou must not only run the physical library, but also update and upkeep the library collection, research new books, and manage the staff. He gestures to the computer area. Every seat is occupied, and people are sitting at surrounding tables waiting. Hazou notes that this is the only venue for some people to access the Internet, or even computers. He is quick, however, to also gesture towards the rows of books, occupied by a few absorbed readers, and the more populated children’s section. And here, Hazou has hit upon the crucial element, the reason why people like George Murphy and the Friends of the OB Library are fighting so hard to keep the libraries. With the 3.8 million dollars that was cut from the budget, I could pay for my own Internet and buy hundreds of thousands of books on Amazon, but where would that get me? Alone in a house filled with towering stacks of books, more likely to crush than to educate. Without the human element of the library – the combination of resources, knowledge, and community – all that information is just words. Thanks for the story, Mary. I’m in the library right now! There’s plenty of folks here utilizing this wonderful place. OB Library needs to INCREASE the number of hours it’s open, there are so many people who rely on it. I was bummed at the long list of online databases that were cut. Those databases can be handy for research (and are accessible 24/7). Thanks for the timely update Mary. The library department budget was cut 10%- more than any other general fund department. Why does our library system continue to sustain disproportionate cuts? Why is it chronically underfunded? The library is the only department that had hours reduced. Why is that? Will the mayor demand more library cuts in July, when the new fiscal year begins? There is a notice about the new hours on the library homepage. You can leave a comment, which I have been told goes to the mayor’s office. Thanks Mary, its good to know what’s going on with the library managers and such. As Anna noted, the new hours have been listed on the website….I’m not happy that the OB library now becomes less accessible to people who work 9-5 jobs. That has always been a problem, and now its getting a little worse. It is a great article, however, you have misquoted me a few times and your facts where not accurate regarding my history and statements. I would like you to come in and make the corrections. Sure Elias, I’m sorry about that. The quotes from you were directly from my recording device, but I hope were not taken out of context. I will come in this week to talk to you.